When it comes to flowering bonsai, nothing is more striking, colorful, and unique than a hibiscus. The large leaf and flower size can be an intimidating obstacle to anyone attempting to shape a bonsai from a hibiscus, but the payoff is a gorgeous plant that produces striking, vibrantly colored flowers the whole growing season and provides a wide variety of flower colors to choose from. Description Hibiscus is a flowering shrub of the mallow family. The shrub is native to the tropics and other regions that enjoy tropic-like climates. Hibiscus plants cannot tolerate extremely cold or freezing conditions. The blooms are large and showy, and the many varieties of hibiscus offer a wide range of flower colors from which to choose. The plant is an ideal bonsai candidate and it makes a particularly beautiful bonsai plant that is a study in contrast: The huge, richly-hued blooms contrast with the glossy green leaves on the bonsai plant – and they in turn contrast with the light-colored trunk and branches. The overall effect is nevertheless complementary. Position A distinction must be made between tropical hibiscus plants and hardy hibiscus plants: Tropical hibiscus have glossy, green leaves. They like sunlight but do require shade in the summer. When grown indoors, supplemental light is required during the winter period. Tropical hibiscus will suffer leaf-drop in cold temperatures, and they will almost certainly be killed by frost. Hardy hibiscus plants have matte leaves. They will grow in sunlight or shade. Even though they are hardy, the plants do need some winter protection. Watering Hibiscus bonsai plants should be watered daily. Feeding Hibiscus plants require regular feeding to support leaf and flower production. Pale-colored leaves and sparse blooms are clear indications of nutrient deficiency. The plants prefer organic fertilizers. A liquid organic fertilizer that has balanced nutrients is ideal: Fertilizers with bone meal is particularly useful for stimulating flower development. Blood meal will stimulate leaf growth. Leaf and Branch Pruning The plant can be pruned to shape as desired. The roots should be pruned during periods of warmer temperatures when growth is most active. Re-potting & Growing Medium Re-pot the hibiscus every year to replenish soil nutrients. A soil that is moisture-retentive while allowing drainage is ideal: A soil containing 50 percent organic matter and 50 percent aggregates is a good balance. Wiring Hibiscus plants do tolerate wiring. Nevertheless, young wood has a tendency to spring back. As such, bending of the trunk or branches may require the use of turnbuckles and guy wires. Notes Pruning will ultimately control leaf size but, if small leaves are desired of a hibiscus bonsai plant, it would be better to select a dwarf hibiscus plant, thus saving a lot of time and effort. Hibiscus bonsai plants differ from other flowering bonsai plants in that they will bloom throughout the season if their needs are fully met. Hibiscus is a large, flowering shrub in the mallow family that includes several hundred species. Native to tropical, subtropical and warm-temperate climates, it grows well in warm, sunny weather, and responds poorly to near freezing, and below freezing temperatures. Blooming in literally thousands of colors and combinations of colors, often times nearly every day, the hibiscus is a beautiful plant that lends itself well to bonsai technique. When selecting a hibiscus for a bonsai, it is important to first find out whether the plant is a hardy hibiscus or a tropical hibiscus. Tropical hibiscus plants need a good deal of light to bloom, and while it is a good idea to keep them somewhat shaded during the summer, during the shorter days of winter they will need all the light they can get. Unfortunately with most garden centers and nurseries, the hibiscus plants will not be categorized by type, and will likely all be bunched in together, and it’s up to the buyer to determine which variety of the plant they have purchased. Tropical hibiscus will have glossy, deep green leaves, large flowers of red, pink, orange, yellow that reach between three and six inches in diameter. If, on the other hand, the hibiscus has dull green, heart shaped leaves, with white, pink or red flowers that reach dinner plate diameter, the plant is a perennial, hardy hibiscus. Hardy hibiscus plants need little special care over the winter, while tropical hibiscus should be treated just as their name indicates, as a tropical plant. Avoiding cold, damp weather and soil, and keeping the plants indoors before the temperature begins to drop below forty to forty five degrees at night can prevent any damage to the plant. The principal consideration when selecting a plant for a bonsai should be the size of its leaves and flowers, as this is the one aspect of the plant that cannot be altered. At most nurseries, there are dwarf varieties of hibiscus that have smaller flowers and leaves that are well suited for bonsai. Though there are several hundred species of hibiscus, for beginners, there are two principal varieties of hibiscus are used for bonsai, Hibiscus Syriacum, also known as Rose of Sharon, and Hibiscus Sinensis, or Chinese Hibiscus. Chinese Hibiscus in particular is a hardy variety, and can withstand temperatures to near freezing, but will become deciduous with temperatures lower than fifty degrees fahrenheit or ten degrees celsius. Obtaining hibiscus in colder climates can be a challenge, and may the plants may have to be ordered online, and require winter protection. Propagating easily from from cuttings or layering, however, in tropical climates such as Hawaii or California hibiscus can be obtained from landscapes, and in southern parts of the United States, they are a seasonal item at nurseries and landscaping stores. If purchased as a bonsai online, or from a “big box” store, chances are the plant should be repotted with good bonsai soil, as the soil they are shipped in is likely of low quality, and designed only to retain moisture during shipping, when it would not be watered. Hibiscus plants work well as a large bonsai, due to its leaf and flower size, and has a trunk that can easily be thickened by planting the bonsai in a tub, or the ground. Fast growing, hibiscus plants bud back on old wood easily, and can be shaped by pruning. Younger wood can be springy and may not easily take to wiring and the wood must be fairly thick to take a set when shaping the trunk. Hibiscus bonsai tolerate root pruning well, but this should be done in warmer weather, and when the plant is in active growth. Leaf size can be managed through pruning as well, but a natural tendency for smaller leaves in the specimen can save a good deal of work. As with any bonsai, the most important aspect of caring for a hibiscus is the soil. Because of the small size of the container the plant is growing in, it will burn through the nutrients in its soil very quickly, and should be repotted at least once each growing season. 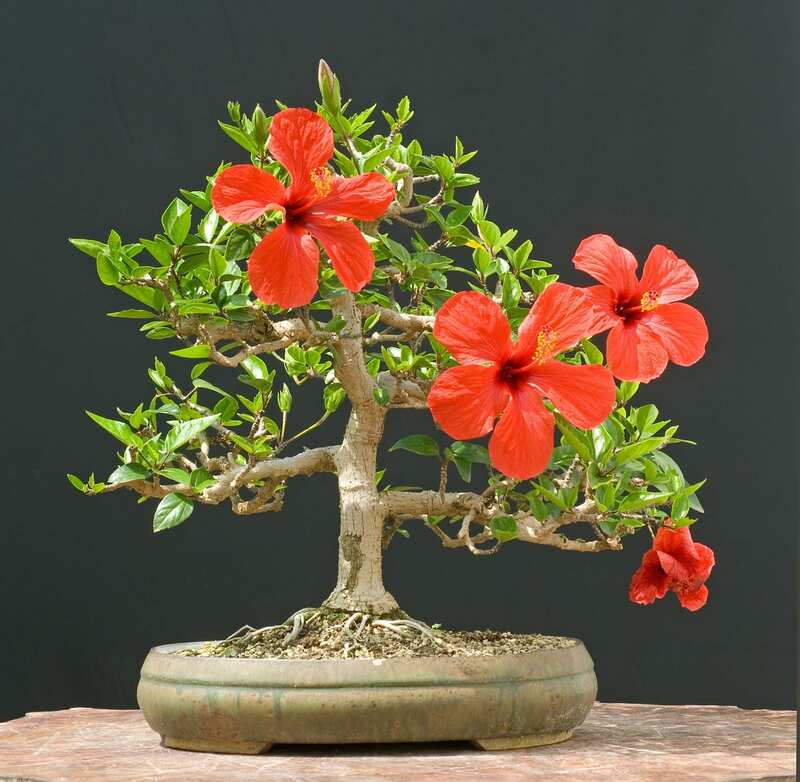 Examining a hibiscus bonsai’s color, foliage and roots is usually enough to determine the plant’s health, whether the current soil mixture is sustaining the plant, and it should be repotted. Hibiscus plants need organic material in their soil to maintain their large leaves and flowers, and a sixty to forty percent aggregate works well. 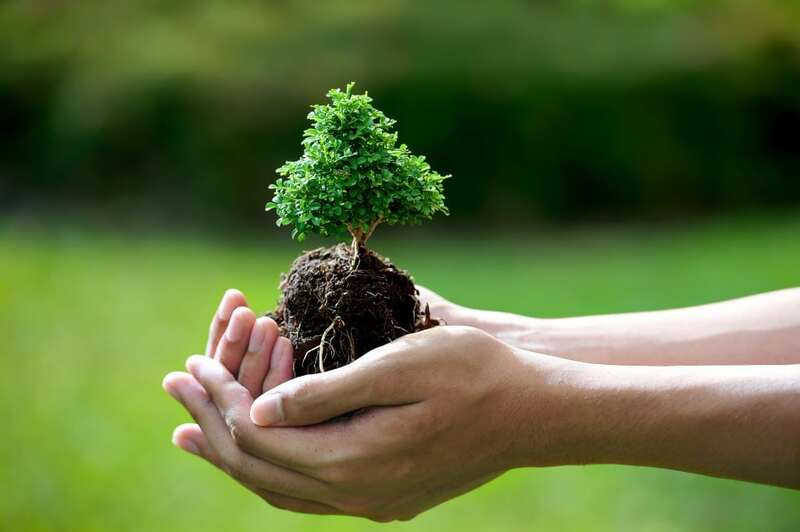 Just like other bonsai, supplemental fertilizer is usually required, and organic fertilizers made for flowering plants, such as blood meal, will ensure good leaf color and flower production. Hibiscus bonsai should be watered daily, and it is important to keep the potting mixture loose enough in the pot that excess moisture can drain, and keep the roots of the plant from being constantly waterlogged. And as with any tropical plant, a generous amount of light will ensure a healthy plant, though for maximum flower production, hibiscus requires a moderate portion of shade during the longer daylight hours of summer. If properly cared for, a hibiscus bonsai will take well to shaping, grow quickly, and produce flowers all season long. A perfect candidate for bonsai, hibiscus plants have a one of a kind look that, with a little patience, lends itself well to nearly any style of shaping.